Alberti's Window: Elizabeth I and a Snake? Elizabeth I and a Snake? I've always liked royal portraits. It's always fun to see how a monarch decides to visually assert his/her power, prestige, wisdom, wealth, etc. In portraiture, these attributes and characteristics of the sitter are emphasized through various signifiers (e.g. lavish, expensive clothing signifies that the wearer of the clothes is rich). What what if the signifier (or symbol) isn't clear or easily understood? But whether these roses were symbolic or decorative, they were obviously added at the last minute. Deterioration of this painting has revealed that the monarch originally was holding a snake in her hand. Based on the remaining visual evidence, an artist has recreated how the snake probably appeared in the original portrait (see below). It is thought that the snake was repainted with roses because of the "ambiguity" of the serpent symbol (again, see Telegraph article). Well, "ambiguity" is right. The well-known symbolic associations with snakes are the Fall, sin, death, and Satan. And I'm pretty sure Elizabeth I wasn't going for those associations. Once in a while you hear about snakes being associated with wisdom, so maybe that explains why the snake was originally included? Can you think of any other symbolic reasons why Elizabeth I would be depicted with a snake? 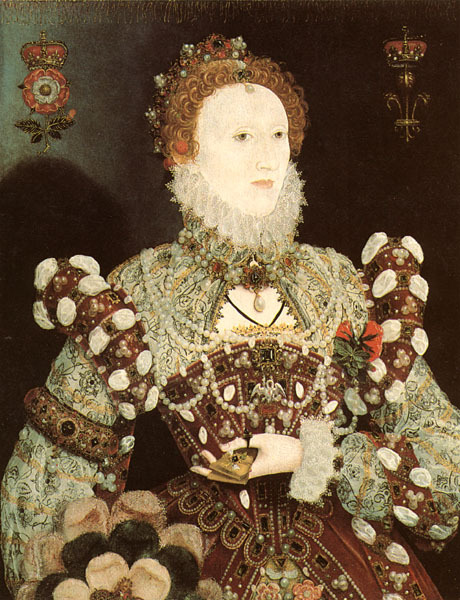 On another note, deterioration of this painting has also caused a strange ghostly appearance on Elizabeth I's forehead. This portrait was painted over another unfinished portrait, and the eyes and nose of the previous woman face have become visible. It appears that the painter of Elizabeth I decided to reuse the unfinished panel, a common practice at the time. 1 You can see other portraits of Elizabeth I with Tudor roses, such as "The Pelican Portrait" by Nicolas Hilliard (c. 1575-1580). 2 This Elizabeth I portrait is part of the National Portrait Gallery (London) collection. It has not been on display for almost a century, but will soon be exhibited as part of the show "Concealed and Revealed: The Changing Faces of Elizabeth I." The show runs from March 13 to September 26.